The Tennis Ball Machine Superstore is your place to find all of your wants and needs for tennis ball machines and tennis machine accessories. With hard to find machines in all different price ranges, the Tennis Ball Machine Superstore has something for all budgets and levels of tennis enthusiasts from all over the world. The Tennis Ball Machine Superstore offers machines from many different manufacturers including Sports Tutor, Lobster Elite, Wilson, Match Mate, and Sam. They also offer machines from all of these manufactures at levels from beginner through intermediate to professional. They have machines with a wide range of capacity options and in all different price ranges. No matter what your skill set or brand choice, Tennis Ball Machine Superstore can accommodate. If you are a beginner, the Tennis Ball Machine Superstore offers you an extensive selection of machines including cubes and towers. Each machine can be set at different time intervals and have different ball capacities to accommodate your strengths. For professionals, they have machines that come in the largest ball capacities and have digital programming displays. Anything in-between these can also be found on their site. 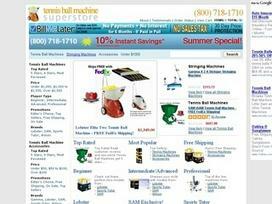 The Tennis Ball Machine Superstore also offers more than just tennis ball machines. They offer accessories including hoppers, replacement rollers, and even pressureless balls to use in your machine. They are also a one stop shop if you want live equipment as they sell pressure balls from Gamma as well. From the purchase of your machine all the way through participating in a tournament, the Tennis Ball Machine Superstore can supply you with just about everything you need but your racket. Is your tennis racket broken? No problem with the help of the Tennis Ball Machine Superstore. They carry an extensive selection of stringing machines from Gamma to repair any racket you have. You can also find many accessories for your stringing machine including replacement parts and machine covers. Regardless if the racket is broken or you are an avid player that likes to keep your racket like new, you can get everything that you need at the Tennis Ball Machine Superstore. Tennis Ball Machine Superstore provides various ways of saving by the use of online coupons and promotional deals. They are reducing online shopping expenses by offering the various discounts that come with online shopping. The list of promotions is refreshed on a daily basis to provide you with the up-to-date offers. These offers are listed here from Tennis Ball Machine Superstore can be used like the coupons ordinarily used in a store for everyday shopping. The Tennis Ball Machine Superstore has it all for any tennis enthusiast. From beginner machines through professional to stringing machines, balls, and accessories, you can find it all at the Tennis Ball Machine Superstore. Share what you think about Tennis Ball Machine Superstore, and your favorite ways to save there!